Photo by Natalynne DeLapp, EPIC. Photo by Natalynne DeLapp, EPIC. A 60-inch tree that is not marked to be cut. Last week, forest activists partially peeled back a barricade, which has been blocking Humboldt Redwood Co.'s main road into its 8,000-acre Mattole watershed timber holdings since early July, to let a group of foresters, environmentalists and some of their own through to examine an area the company wants to log. And then, after the field trip, the activists agreed to keep the access open to allow in ATVs bearing HRC biologists endeavoring to resolve issues in several timber harvest plans the activists are protesting. HRC agreed, in turn, that if it decides to resume operations on the disputed harvest plans at any time (presumably before resolution is reached), it would give the activists a week's notice. "We're going to honor the blockade," says company president and chief forester Mike Jani. The company also tentatively agreed to limit its herbicide use in some places, and on last Wednesday's field trip a forester even unmarked some big trees that had been blue-lined to be cut. Most significantly, HRC agreed to begin refining its old-growth policy by establishing a brand-new designation to preserve at least some of an unusual type of forest rarely found in the historically heavily logged region: "un-entered" forest. It's a major turning point in a situation that has threatened to undermine the green peace that Humboldt Redwood Co. famously forged with forest activists six years ago when it took over Pacific Lumber Co.'s operations following that company's death and reorganization. At that time, HRC promised tree-sitters who'd been perched in Palco old growth for three years that the company would protect the ancient ones. Like its parent company, Mendocino Redwood Company, HRC then gained sustainability certification from the Forest Stewardship Council. It voluntarily established old-growth restrictions and set aside "high conservation value" areas to protect old growth stands, including about 200 acres in the Mattole. But the activists say the company's definition of old growth is too narrow. And it is this disagreement that provoked them. In April, they hindered HRC crews cutting a road into one of the harvest areas. They climbed into trees to guard sites. And then they put up the barricade, to which they anchored a tree-sitter platform suspended in air — cut the line, and the tree-sitter plummets. HRC's old-growth policy aims to protect unharvested old growth stands, as well as old-growth trees in previously harvested stands where the company might cut some younger trees to enhance old-growth characteristics (with thinning, the trees left behind grow bigger, faster). It also protects individual old-growth trees (hardwoods and conifers). It defines old-growth by girth (36-inch diameter for a Doug fir, for instance), age (established before 1800) and other structural characteristics. Much of the preserved old-growth in the Mattole lies in stands of Douglas fir on the north side of Long Ridge — a long mountain with a grassy plateau on top and steep, rolling, wooded sides. 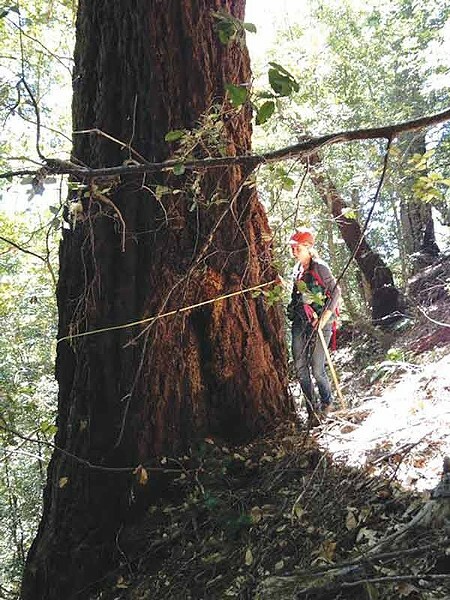 Two of the disputed timber harvest plans comprise about 800 acres on the south slope of the same ridge (the third, around 250 acres, is on a ridge next to Humboldt Redwoods State Park). Jani says one of these Long Ridge timber harvest plans calls for tractor logging and cable yarding. The other, because of steep, unstable terrain, calls for some tractor logging and cable yarding but, mostly, for helicopter logging. The south slope is a mosaic of different ages and types of trees, including some old-growth trees scattered about — but not the average of six old-growth trees per acre required by HRC's existing preservation policy. There are patches of tanoak, of Douglas fir mixed with tanoak and madrone, and of Douglas fir. Some stands are on old Palco clearcuts. And some are those un-entered (unlogged) forests, including densely packed stands of straight Douglas firs around 150 or so years old. One theory is that a fire, or a landslide, swept through and wiped out all but the most-resilient old trees in the forest about 150 years ago, and then the forest grew back. Jani says another likelihood is that these young-old trees grow in areas which, pre-white contact, indigenous people kept open and grassy with routine burning. Regardless, say activists, they're unique. "We're saying no logging in un-entered forest, old growth and areas on the borderline of old growth and late seral [forest approaching old-growth]," says Ama Tierney, one of the forest defenders. The forest defenders define "old-growth" as trees 150 years old or more with old-growth features such as broken tops and a complex canopy structure, in areas with dead and downed logs and other wildlife habitat features. Members of the Environmental Protection Information Center and the Mattole Restoration Council who've joined the discussions and field trips are not as hard-line as the activists. "I think there's room for management in un-entered forests, if it's done in an ecologically defensible way," said Natalynne DeLapp, executive director of EPIC. But, DeLapp says, EPIC wants HRC to allow an independent forester to do an audit of the redesigned harvest plan the company seems to be more or less committing to, to ensure that "what they're going to cut in these un-entered forests is in fact going to result in older, bigger trees" and a resilient forest, DeLapp says. Ali Freedlund, with the Mattole Restoration Council, has been commenting on timber harvest plans since 1996, and she helped HRC finish the watershed analysis started under Palco. The Long Ridge THPs comprise the largest proposed harvest she's ever seen in the area. But after seeing the proposed harvest areas, she concluded that the timber company had designed, overall, a pretty good cut. Still, the company's concessions to trying to protect un-entered forests excite her. "That they're opening a new designation for these kinds of forests is huge," Freedlund says. "And we have the forest defenders to thank for initiating that." In the end, all parties might not agree on everything. Jani figures most everyone can agree that the un-entered forests exist and need some kind of special consideration, and that individual old-growth trees should be protected. The forest defenders might stick to their stance of no cutting at all in the un-entered forests, and in what they consider old growth. But Tierney says they want the negotiations to proceed. "We could help with the surveying," she says. "We could lead people to places we know are un-entered." Freedlund says it's amazing, after decades of Palco, to have a timber company willing to engage with its critics like this. And at least, she adds, the land in question isn't being developed to death. "The amazing thing about Long Ridge is there's lots of water — a lot of creeks and springs," Freedlund says. "It's vigorous. It's healthy. It really seems wild. If the timber company didn't own it, what would it be then? We're already struggling with other areas that are heavily managed in 'other' ways. I couldn't imagine what this area would be like dotted with homesteads or greenhouses."